Uncle River's cultural Speculative Fiction has appeared in Asimov's Science Fiction, Analog Science Fiction and Fact, Amazing Stories, Interzone, Absolute Magnitude, Talebones, and the Year's Best Fantasy anthology, among many others. Places to look for his fiction in 2005 include Analog, Tales of The Unanticipated, Space & Time, Challenging Destiny, and Hadrosaur Tales. He has had work on the Preliminary Nebula Ballot, and been a finalist for the Sturgeon Award. 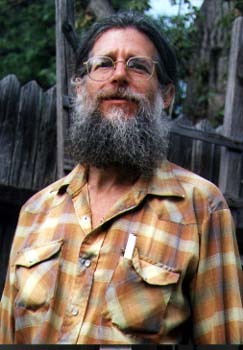 Trained in Jungian Analysis and holding what he believes to be the world's only earned Ph.D. in Psychology of the Unconscious (Union Institute, 1974), Uncle River has lived as a hermit/writer in the mountain Southwest for the past 25 years. which both requires individual consciousness and treats it as a crime? shops, and in History of the World, Part MMIII undergraduate seminars." . .
who first organized the Cosmos for human perception....worth attending." . .
.Tom Easton, Analog Science Fiction And Fact. complete, and compiled into book-manuscript format. right places." . . . Don Webb, The New York Review of Science Fiction.